On October 18, 2014, at age 77, Ethel Precht kicked off the largest-ever non-profit fundraising walk in all of southwest Louisiana. Now in its 10th year, the Ethel Precht Hope Breast Cancer Walk has grown from 400 walkers to more than 5,000 participants, all committed to raising vital funds to help women fighting breast cancer. 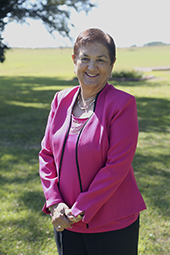 Incredibly, the walk that Ethel initially conceived simply to raise awareness of breast cancer in Calcasieu and Cameron Parishes is now an important fundraiser on a scale that rivals similar events in some of America’s largest cities. The most successful advocates and crusaders usually don’t go looking for a cause. Instead, their cause finds them. In most cases, a situation or conflict confronts someone so intensely that they feel compelled to focus their energy toward a positive resolution. This was certainly the case for Ethel Precht, whose personal experience overcoming breast cancer fostered a deep sense of commitment and urgency to help others with the same affliction. Known by her friends and family as a quiet and shy woman who always deferred to her husband and traditional figures of authority, Ethel used her personal battle and ultimate victory over cancer as a transformative experience that compelled her to action. It was an “if not me, then who?” moment that gave her a voice she never expected and couldn’t suppress. Life experience can change us in ways we never thought possible. Our base of knowledge evolves through the years, and the experiences we gather in life continue to reshape not only our vision of the world but also our place and purpose within it. Most importantly, we become able to recognize those things that are truly important and worth fighting for. Years of life experience gave Ethel Precht a mission and voice that she has embraced with all her heart, powerful and vibrantly displayed through the Ethel Precht Hope Breast Cancer Walk. Ethel Precht … Peoples Health Champion.